Between 1962 and 1979 the NSF Polar Research Vessel Eltanin (below image) surveyed Antarctic waters, studying the ocean and ocean bottom. In 1964, the ship photographed an unusual object at a depth of 13,500 feet. At the time, there was no submarine that could have carried a piece of technology to this depth. The object appears to be a pole rising from the ocean floor with twelve spokes radiating from it, each ending in a sphere. The spokes are at fifteen degree angles to each other. It is located approximately 1,000 miles south of Cape Horn, beneath some of the most inhospitable seas in the world. Marine biologists have speculated that it might be some sort of an organism, largely because it is otherwise so difficult to explain. However, there is no known form of marine life that looks remotely like this object. napped by an automatic camera trailed by the Eltanin on 29 August 1964. There exists the possibility that it is an antenna or other scientific instrument that was lost by an early research vessel, but once again, this would appear to be a very forced explanation. It seems unlikely that an object could drop through three miles of ocean, and anchor itself on the bottom. In addition, the position of the antenna is so exact, and so strangely significant, that it would seem almost certain that it was intentionally put there. Who did it, with what technology and why remains unknown. However, it’s clear that there could be an enormous secret connected with the Eltanin antenna, and one that might not be entirely unknown to certain members of the scientific community, as will be seen. Researcher Bruce Cathie, a New Zealander who, among other things, had a famous series of UFO sightings, has developed a theory about the antenna based on its position on the planet. Cathie’s theories suggest that the antenna may be part of an ancient planetary grid that is of fundamental importance to an understanding of our planet and the great 25,000 year cycle known as the precession of the equinox. 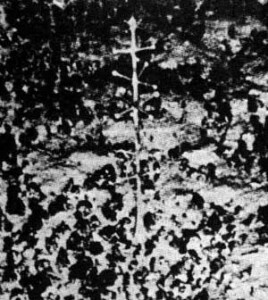 Could it be possible that the Eltanin Antenna is a piece of ancient technology, or even technology that comes from another world? Cathie certainly thinks so. Other researchers are now suggesting that modern science might be well aware of the purpose of the object, and might be actively monitoring it or using it in some way. Mr. Cathie considers 144, the harmonic reciprocal of the speed of light, to be an important measure of the earth’s grid because it divides into the planet’s 21,600 minutes of arc exactly 150 times. An individual interested in Cathie’s ideas began measuring outward in steps from the antenna, and to his surprise found that the Prospect Point Antarctic Base is precisely eight of these measures away. Add another unit of 144 and you find two more Antarctic bases, Hemus and St. Kilmet. Remarkably, a whole array of bases and earthquake stations surround the Eltanin Antenna. What this may mean is unknown, but it is certainly suggestive that the Eltanin antenna is no strange marine creature, but rather an object of great importance, that somebody understands very well. The brighter white spots show sightings places. 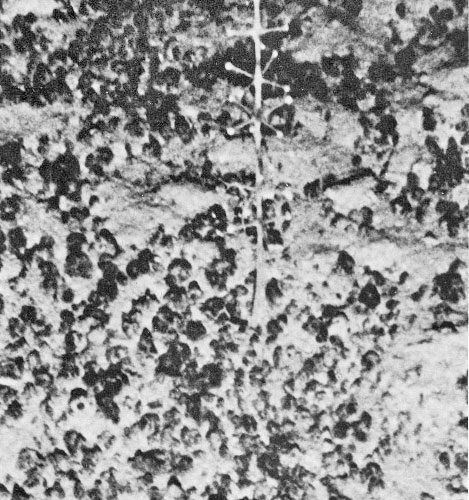 Green arrows at bottom (105W x 59S) indicate an odd undersea object photographed by USNS Survey ship Eltanin in 1964. A vast ocean area West of South America registers no UFO sightings in this database.